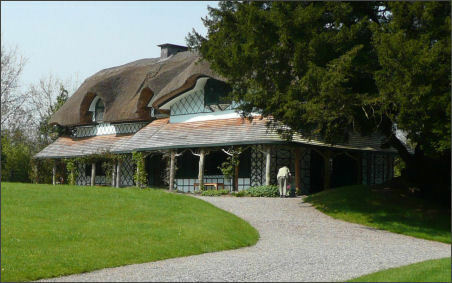 About a mile south of Cahir town, on the bank of the River Suir, is a charming house known as The Swiss Cottage. This is a fine example of "Cottage Ornee" or fantasy house, popular with the gentry in the nineteenth century, where they could play at being peasants and entertain their guests. It was built around 1810 for Richard Butler and his wife, Emily, Lord and Lady Cahir, and was designed by the famous English architect, John Nash, who also designed the Church of Ireland church in Cahir town. The house is inspired by nature and this is evident in such things as the curving thached roof, the external woodwork resembling branched trees, and the natural themes on the wallpaper and other internal furnishings. It is situated on raised ground overlooking the river and is accessed by a flight of stone steps. Admission is by guided tour only and costs € 2.50 for adults with reductions for children, senior citizens and groups. The car park for the Swiss Cottage is signposted from the R670, the Cahir to Ardfinnan road. Alternatively, you can walk to the site from Cahir Castle car park on a footpath which passes through woodland and along the river bank.